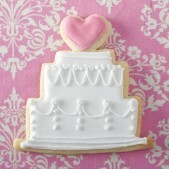 For a modern and tasty alternative to a traditional wedding favour, opt for wedding cookies! Our wedding favour cookies are freshly baked with the finest ingredients and can be tailored to be the perfect accompaniment to your wedding cake. 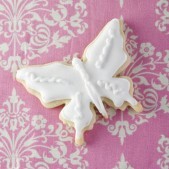 Wedding Favours are a very traditional part of any bride’s big day and wedding cookies and wedding cupcakes are an ideal modern take on a very traditional idea. A wedding favour would usually be given to each guest as a reminder and thank you for being part of the bride and groom’s special day. 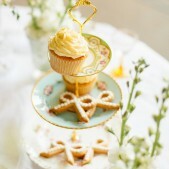 Wedding cookies or cupcakes can also be used as place settings. 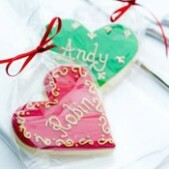 An edible wedding favour is a tasty way to thank your guests and can be personalised according to your colour schemes, wedding theme or even to the bride’s bouquet or dress. We are happy to sit down with you and talk about your plans for your big day so that we have a clear idea of how best to complement your wedding with delicious reminders of a fantastic day. Wedding Favours are a contemporary addition to your special day so let us help you enjoy it even more with perfectly designed edible treats for you and your guests. 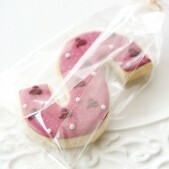 We bake our wedding favours fresh with each order to ensure that you have the tastiest items on your big day. 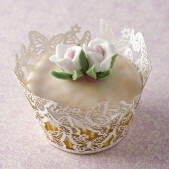 We can offer free delivery of your favours from our cake studio in south west London or for a small surcharge we can deliver to areas outside London. Please ask us about delivery to your location. Contact us today to order your wedding favours, wedding cake cupcakes as well as your main wedding cake and let us coordinate all of your sweet treats to be the ideal complement to your wedding day. 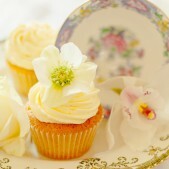 You are also welcome to arrange a sampling session or to pop in any time to view our portfolio for ideas.